Product Consists : Bouquet of 12 Mix Roses (Red, Pink, Yellow & White) with some fillers in a cellephone wrapping, 16 pcs Ferrero Rocher Chocolate Box along with Christmas Greeting Card. 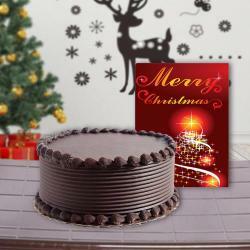 If you are looking for any special gift for your dear ones on this Christmas than this gift combo is a perfect match for your search. It includes one rose bouquet filled with twelve roses of different colors. It has four red, four pink, four yellow and four white roses. The rose bouquet is formed very beautifully. This gift combo also includes one Box of ferrero rocher chocolates. The Box contains sixteen pieces of chocolate. 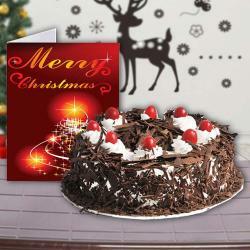 Last item of this gift combo is a Christmas greeting Card which also looks quite attractive with its glowing colors. 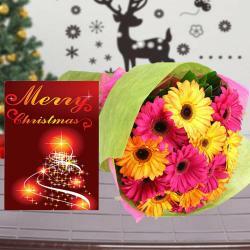 Make your dear ones feel delighted with this gift combo. 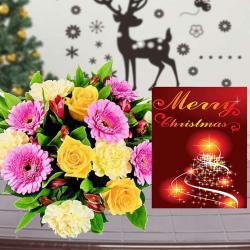 Product Consists : Bouquet of 12 Mix Roses (Red, Pink, Yellow & White) with some fillers in a cellephone wrapping, 16 pcs Ferrero Rocher Chocolate Box along with Christmas Greeting Card.